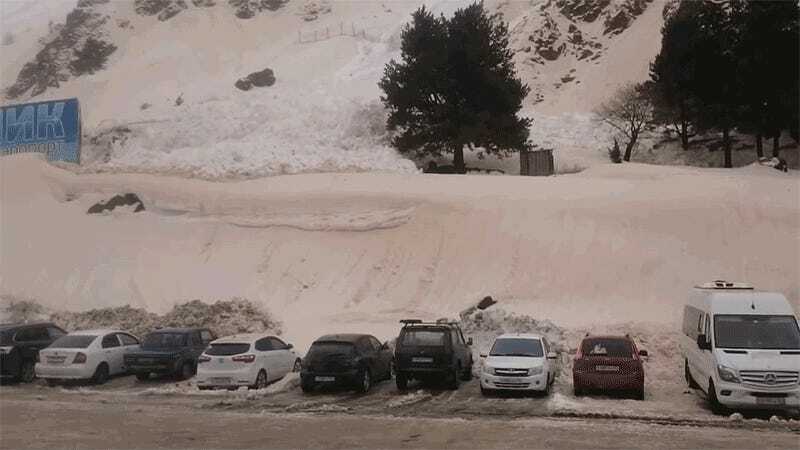 The 18,000-foot Mount Elbrus is a proud mountain, and it recently displayed its natural grandeur in the most appropriate of ways: by dropping an avalanche onto a parking lot and eating a bunch of cars. No one was hurt in the avalanche, as RT reports, but it’s pretty apparent that some of those cars are not getting out of there under their own power. Interesting to note is that the snow you see here is orange, thanks to dust being blown in from the Sahara, as noted by the Telegraph. Is this video clear evidence that Mother Nature is claiming revenge for climate change by consuming these internal combustion vehicles? I’m going to go with not only a yes, but a yes and honestly we deserve it.